PCS manufactured products have a 3-YEAR SHELF-LIFE! Keep containers sealed and unopened to minimize exposure to oxygen and oxidation of the product. Store away from windows and direct sunlight. Store away from heaters or forced air vents. Store away from exterior walls, if possible. Shelf life of a full unopened container is three years (no contamination from potential airborne contaminants). Product from opened containers should be repackaged into smaller plastic containers sized to be ‘full’ of product. 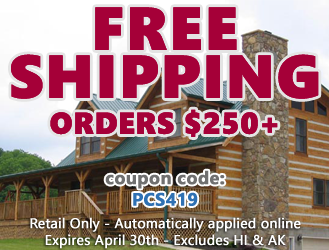 Order you free samples today! Every year Perma-Chink Systems is involved in community projects across the country. 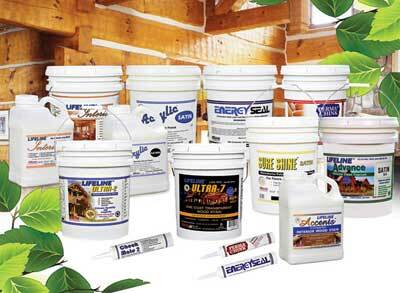 When appropriate, we donate some of our premium wood finishes and log home sealant to the project. The wonderful citizens of Victor, MT decided they needed a brand new "Welcome to Victor" sign constructed out of logs. They contracted Shane and Virginia from HBH Chinking to stain and finish the job. After cleaning and preparing the logs with Log Wash, they used Lifeline Ultra-7 transparent wood finish in Chestnut (#365), Lifeline Advance clear topcoat in Satin, and Log End Seal to enhance the natural beauty of the wood and provide years of protection from the sun and elements.